My wife recently upgraded via the About Device to an upgraded version of Android. I believe her phone already had KitKat 4.4.2, so I don't know what the upgrade actually did. However, now whenever she turns off the phone for a while, the Messaging app pops up and prompts her to "set the Messaging App as the default messaging app." 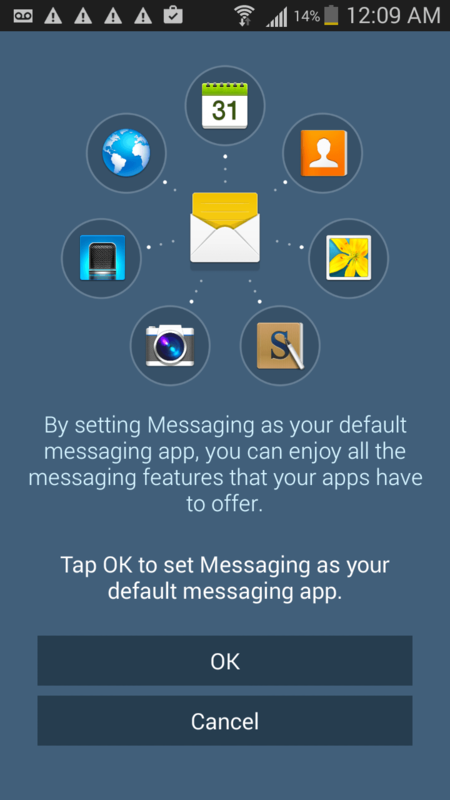 I went to the application manager and turned off notifications from the Messaging App. This did not work. I attempted to search for this same problem and did not find any answers. Is there anyway to disable this from happening without root? It's like Google decided that the best move for them to make is to become the "Ask.com" search bar for Android. I've attached the screenshot to this post. Well @herschen that doesn't looks like an issue to me, Tap ok over here and make the messaging as your default messaging app ! My wife is about to cave from the pressure and go back to messaging.